Poor muscle tone is why. 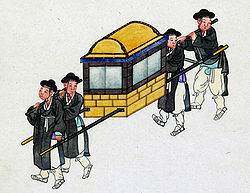 A Korean gama, circa 1890, via Wikipedia. I'm working on new, low-energy ways to hurt myself. I once unhinged my back by turning to flush the toilet. Turning, you know, in a seated position. The pain was such that I could only move by grabbing a shelf, propping myself up in the doorway with my elbows and spidey-walking myself to the bedroom by the tension of my arms against the walls. Probably naked from the waist down, though that detail is mercifully lost in the mists of time. I have also hurt my back pulling up the covers in bed. I don't know by what mechanics I was able to do so much damage, but I spent my whole Sunday in Rye walking like Frankenstein's monster with gritted teeth and tears running down my face. Can you picture that? The only shop open was the petrol station, and they only sold Nurofen, which, it turns out, was not equipped to touch even a corner of the pain, but by the time I discovered that I'd already taken the 12-hour dose and anyway there were no other painkillers available. But if I'd taken aspirin, you know, I just would've taken more at intervals until I felt better. You know where you are with aspirin. Less likely to give yourself liver failure. So last night I hurt my back in my sleep. Yes. I have no idea what happened, for obvious reasons. I began to turn over in bed this morning and was aware, though asleep, that pain was caused, and I dropped off again and so it continued until I surfaced properly to get up for a wee. I hobbled downstairs and took some aspirin and went back to bed but nothing has changed. I'm still officially indisposed. We're supposed to go to a swanky cocktail party this evening and aside from the primping required, I'll have to be getting on the trains and the tubes and then there will be the walking and talking part of it, all of which I feel ill-equipped to carry out. It's in Hoxton, which is somewhere I never go because I don't look good in a handlebar mustache/skinny jeans/lumberjack shirt ensemble and also I'm not in my 20s and I don't have any connections with a gallery or a strategic innovation agency. But I can be totally on board for the canapés. And I wanted to wear my really nice gold shoes with the wooden platforms, which I fear are no longer an option. Unless I'm offered a sedan chair. But that almost never happens. I'm a worrier, a catastrophizer, a complainer, agoraphobic, know-all and pedant. I want to be grateful, but I'm just not very good at it.